Not for the faint of wallet. 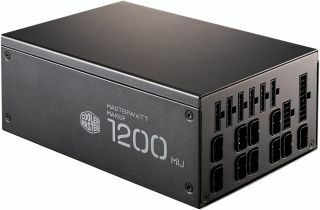 Cooler Master is giddy as all get-out about its newest power supply, the MasterWatt Maker 1200 MIJ, a 1,200W unit that is made in Japan with a combination of Japanese and German components. The implication there is that it's a high-quality PSU, and it has a high price tag to match. We'll save your monitor the coffee bath and the let you finish your drink before getting to the MSRP. As to the power supply, Cooler Master says it started as a research project into the future of PSU design for the next decade, and how it could improve on the best analog PSUs to date. That led the company to being very specific in sourcing parts. "When it comes to most electronics these days, they’re either made in China or Taiwan, with a few exceptions that are usually manufactured either in Korea or Japan. 80 percent of the components used in this power supply are made in Japan. More than 20 pieces of them have even been custom designed by Murata for this PSU, because the common parts available on the supply chain market simply weren’t cutting it," Cooler Master says. Murata is a popular electronics and components manufacturer in Japan that supplies parts to clients in various fields, including robotics, automotive, and space exploration, to name just a few. "The MasterWatt Maker 1200 MIJ was built using the highest quality components available, to the standards of some of the most stringent electronics engineers in Japan," Cooler Master added. "Some parts of the PSU use a design where two components were implemented instead of one, to help lower the generated heat and to increase the components’ lifespan. Many of these components are rated to work at temperatures of up to 150C." The culmination of all this design goodness is a 1,200W PSU that is fanless at up to 600W (50 percent load). It also features fully modular cabling, 80 Plus Titanium certification, and up to 100A over a single +12V rail. Finished that coffee yet? Good—Cooler Master's asking price here is $1,000 (£900).